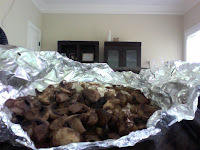 This one is easy and tasty simply cut up some mushrooms, with a few cloves of Garlic, a little butter or olive oil and some garam masala and salt and bake at 400 degrees for 15 min. How simple but totally delicious! I love me some mushrooms. Nice idea to bake them. don't think I maked mushrooms, yet. At least from what I can remember. I always like them stuffed with seafood, and stir-fried. Shall try them grilled next time! I am going to try this one for sure--I love mushrooms and this is so simple too. Yummy, I usually sautée mine, but I'm sure these were equally good. Very simple, but sounds delicious. I love mushrooms. MMMM...a simple yet so tasty mushroom dish! Thanks for dropping by at my blog. Will be a regular visitor here. A good mix of news related to food. 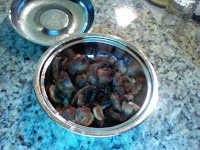 Adi and I love mushrooms-I just saute it and then add some salt and pepper for him. He even loves it when I make burgers with it for him! Wow... thats an easy recipe with mushroom...looks yum..
Great idea, love the addition of garam masala to the mushrooms! Nice!! Mushrooms are my favorrrite :) I've never made them that way, though! Can't wait to try! Sweta; oh they love it came to India for our wedding! Sarah another new thing for ya! What a great way to treat mushrooms! I'll be making these!!! Sounds great! I'm a huge fan of mushrooms. I don't prepare them nearly as often as I could. Yum. I love mushrooms. I love mushrooms. Love them. I even love them out of a can. This is a totally happy dish.